The National Business and Technology Conference (NBTC) fosters and empower future leaders through the development of their skills and expertise. Delegates of all disciplines, undergraduate, graduate students, and young professionals are welcomed to this opportunity to learn, explore and from academia and industry. 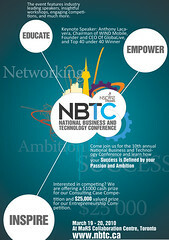 This year’s NBTC takes place on March 19th and 20th at the MaRS Collaboration Centre located in the heart of downtown Toronto. Conference keynote speakers include Anthony Lacavera, Chairman of WIND Mobile and George Ross, Deputy Minister of the Ontario Ministry of Research and Innovation. As one of NBTC’s signature events, their Entrepreneurship Competition allows teams from across the country to present their innovative business plans to a panel of experienced entrepreneurs and industry professionals. The competition provides teams with an opportunity to showcase their ideas and interact with like-minded individuals who are dedicated to changing the landscape of modern business. Competitors also gain invaluable experience and feedback, while vying for the grand prize of $25,000 valued services from the MaRS Discovery District. If you’re interested in attending the Conference, register online and take advantage of the limited number of early-bird tickets that are still available.